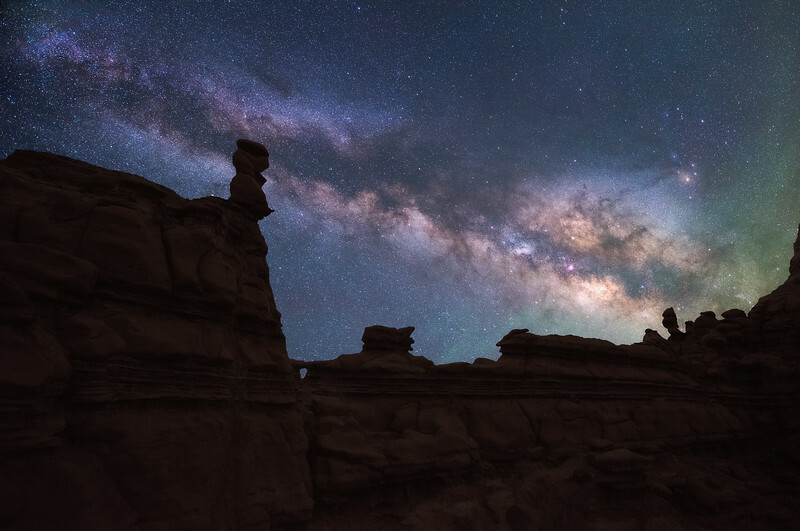 Join us this April 2019, for four nights in one of the most unique, photogenic, and darkest sky locations in the entire southwest. I personally have returned countless times to this valley to photograph it's unmatched dark skies, and strange otherworldly landscapes. The scale of this park is large enough that you could return indefinitely to find new compositions and explore new areas. For this workshop I will personally be leading a group of 6 individual clients through the park and teaching them the techniques I use to create my images. 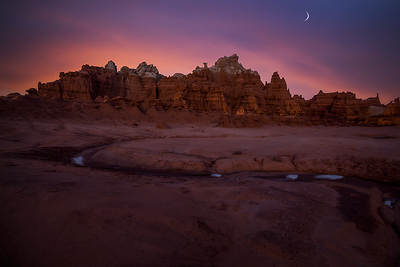 We will spend three days and four nights in the valley, photographing sunsets, sunrises, and the night sky. We will cover a processing session hosted locally to cover techniques used to process the images as well. Our adventure will begin with a meet up and introduction on Wednesday the 3rd, and end the morning of Sunday the 7th. Our workshop has been planned around ideal astronomic conditions to give us a clear view of the milky way core during our nights inside the park. We will arrange times in which we will go out to shoot during the night to experience the unmatched natural beauty of the south wests dark skies. It is also likely that we will have the park to ourselves at night, giving it an extra special feeling of natural beauty. During our stay in this amazon location I will personally guide you on how to capture the night sky, landscapes of the southwest, and show you some of the strangest and most incredible parts of the park. The tuition for this workshop will be $450 USD per client. Please note that all clients must reserve by March 31 and all reservations are non refundable after March 15th. Reservations made before March 15th can be canceled and refunded with a $100 cancelation fee. The park itself is well isolated from any services, a good 50 miles from green river Utah. You will truly experience the tranquility and natural scenery of this area unobstructed by human development. The park provides reservable campsites a mere walking distance from the parks highlight attractions. A yurt may also be available for reservation at this link: Reserve Yurt Goblin Valley. These sites fill up fast so reserve NOW! There are also BLM areas surrounding the parks boundaries that provide large pull outs for RV's and make good camping spots for the night. These areas are free and close to the park. The closest gas station is located in Hanksville, 38 miles from the park. The park does have running water bathrooms, and the gift center is open daily and sells snacks and water. I would suggest packing reasonable provisions for the weekend with you to the park. You can contact me personally by email with any concerns you may have and I will be more than happy to work with you on anything you may need accommodations for. The park itself feels a bit like a maze, of endless Hoodoos with shapes that strangely resemble little Goblins. There is no way to explain the surreal and alien feeling of standing here under it's untainted deep night skies. On several occasions I have witnessed large comets, meteors and other astronomical events that can be viewed in complete natural darkness. In all my traveling to this date I have yet to find an area in the southwest that boasts such dark and pristine astronomical viewing conditions. This location will easily be one of the darkest and most unique places you will ever experience (to say the least). 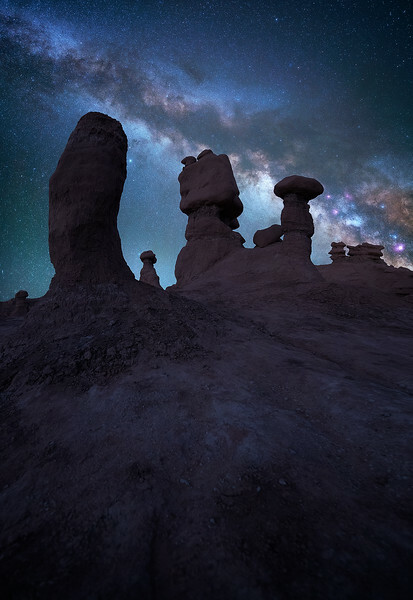 Goblin valley provides the perfect setting for photographing unique astro-landscapes that utilize the light of stars to illuminate our foregrounds. During this workshop I will teach you the things I have learned over several years of returning to this untamed place. I will cover various photographic techniques and tools used to capture the natural beauty of the night sky and milky way galaxy. We will spend a good amount of our time under the stars and soaking in the beauty of space around us. The natural sediment of this area is unique red and orange, and constantly changing due to rain and erosion. fortunately the ground inside the valley itself is often soft and sometimes sand like. This allows anyone to set a tripod in a sturdy position and even sit comfortably while taking photos. In case I failed to mention.. Goblin Valley hosts one of the darkest, clearest and widest view night skies you will ever experience. In many cases I often experience a large amount of natural "Air glow" a natural phenomenon that appears quite magnificently in digital SLR images. "Air glow" can appear green or even shades of red similar to the northern lights, on camera sensors and add a uniquely beautiful look to night images. During our time inside the park I will show you how to properly expose the night sky for maximum detail. We will cover my photographic process for planning images and every step from arrival to the final touches needed to prepare a file for print or web. Some of the photographic concepts we will cover will included image stacking to reduce noise, maximizing your foreground detail to be as clean and detailed as possible, and nearing the end of our workshop an introduction to star tracking and the advantages of using equatorial mounts to "Track" the stars. If you have a star tracker I would highly recommend bringing it, an if not, not to worry we will cover the process used to create stunning night photographs without astronomical equipment as well. The techniques we will cover will be useful for everyone from photographers to digital artists. ** I will do my best to reserve campgrounds inside the park for us to use, however the window to reserve these is not yet open. If I am able to make these reservations than a campground (pavilion tent area and parking spot will be included for you) . I will make these reservations the moment they are available, I just cannot ensure that I will get them at this time.** . The area is very close to an open BLM area (about 10 - 15 miles from the park) with pull offs and decent camping spots should for some reason everything is reserved.